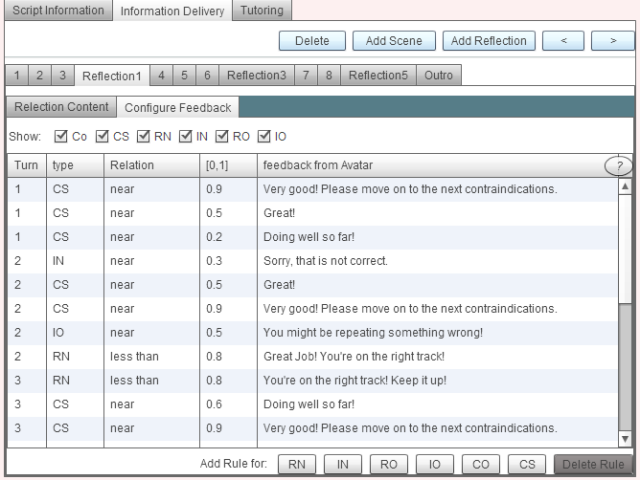 Description: You can edit the feedback the animated agent will provide several ways. For every "turn" the student takes, you can add several rules to account for all possible student responses.You can tailor the feedback for the following cases: student provides irrelevant information, new but irrelevant information, new relevant information, old relevant information. Description: The learner's characteristic curve (LCC) is the student model that AutoTutor LITE uses to provide customized feedback for each student response. ATL uses this student model to provide relevant and accurate feedback to each student response. From left to right: Total Coverage indicates the total % of the answer the student has covered. Each bar indicates a student response, Relevant & New indicates the relevancy of new information provided for each turn, here the student provided no relevant and new information for turn three. Relevant and old indicates relevant information the student is repeating. For example, on turn two the student provided relevant information, but part of the answer has already been stated. Irrelevant and New indicates new information the student provided per turn, but information that is irrelevant to the target answer. Irrelevant and old information indicates that the student is providing incorrect and old information. The Tutor feedback can be modified to provide information for each one of these student response qualities, for each attempt the student makes.